The recently crowned journalist of the year Laura Kuenssberg came to earth with a bump when the BBC Trust found she had broken impartiality rules when reporting one Jeremy Corbyn story. The BBC political editor has long been accused of anti-Corbyn bias but this is the first instance where the Trust has actually recognised her bias. 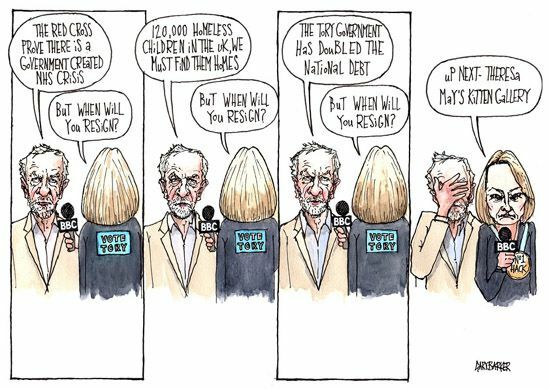 However this has done little to sway other BBC staff from doing the same when Corbyn was interviewed about the NHS crisis all the BBC interviewer was interested in was asking him when he was going to resign. Whether you like Corbyn or not, or whether you are right wing, left wing or whatever it is in all out interests that the media and especially the BBC maintains some semblance of political balance. Otherwise all we have is dictatorship by propaganda.